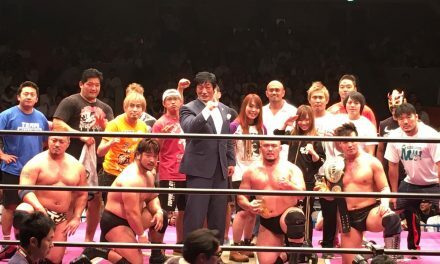 This week in Tiger Mask W we get the series debut of a New Japan roster member, but more importantly, Haruna continues down the road to becoming a joshi star. Tiger Mask takes a step back this week to let his manager shine in the spotlight. 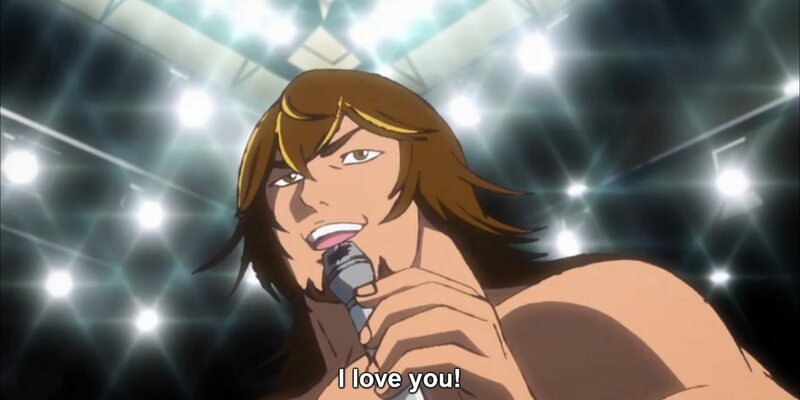 Before we jump into things, don’t forget that you can watch this and every episode of Tiger Mask W over at Crunchyroll and if you want to find the rest of my recaps, you can do that here. The show begins at Takaoka Motors where Haruna is using Naoto’s exercise equipment to get her pump on. She’s having a much easier time lifting weights than the last time me saw her attempt it. Her workout is interrupted when she receives a phone call from Mint, a joshi wrestler we saw a few episodes ago in a tag team called Candy Pair. Mint and her partner, Milk, excitedly tell Haruna that they signed a deal with GWM and offer her a free pass to watch their upcoming match. Speaking of GWM, we go over to the Max Dome where Miss X is working out while her assistant briefs her on some numbers regarding attendance. It would seem that Candy Pair’s announced rematch against Queen and Payne, the Charlotte Flair and Becky Lynch analogs, have increased ticket sales. This quick scene really only happened to show off Miss X’s sweet abs. When she’s not exercising, Haruna is working on being a business genius. The mind behind Tiger Mask’s popular merchandise came up with her next big hit; a cute mask for female Tiger fans to wear. For now the mask is just a prototype, but she has plenty of other merch to send to Tiger Mask while he’s on the road with New Japan. Along with that, Haruna also sent along a care package of stuff a wrestler could use. The only one I recognize is the cold spray, but I’m guessing Icy Hot is in there too. Buffron EX is a box we see and I have to assume it’s medicine that makes you buff? Haruna’s admirer, Ryu Wakamatsu, comments that she will make a great wife. I wonder if that boy will ever get the date he so desperately wants. Back at the Max Dome, Haruna arrives for the Battle Mission show and runs into Tiger Mask W’s Lois Lane, Hikari Kuruma, while getting her backstage pass. They head over the ringside area as Milk and Mint warm up for their match. Milk runs the ropes, but then she suddenly doubles over in pain, clutching her stomach. Smash cut to an ambulance taking Milk away. It would seem that Milk has a case of appendicitis, putting Candy Pair’s match in jeopardy. Battle Mission begins with Alec Myer, a GWM jabroni, taking on Fukuwara Mask. Before we see any action from the match, the shot cuts to Candy Pair’s dressing room where Mint is desperately calling any wrestler she knows, trying to find a replacement partner for her match tonight, all to no avail. Mint hangs her head in shame as Miss X goes on about how cancelling this match will hurt GWM’s reputation. Then, in an unexpected twist, Haruna says that she’ll step in to take Milk’s place as Mint’s tag partner in the match with Queen and Payne. Miss X quickly agrees to the replacement, hoping to see the so-called “annoying brat” take a beating. When Miss X leave the dressing room, Mint tells Haruna that her taking the match was ridiculous, but the words are taken out of her mouth when Haruna pops her shirt off and reveals a shredded six pack. I’ve never seen someone more surprised by abs than Mint was here. Joey Abs could commit a home invasion at your house and you wouldn’t be as surprised as Mint is here. Haruna borrows some ring gear from Mint and looks like a full-fledged joshi wrestler, but she worries what’s going to happen when her uncle sees that she suddenly became a wrestler. If only she had something she recently made to hide her identity…. When it comes to be match time, the announcer says that both teams have undergone changes from what was initially advertised. The first team is made up of Mint and her new partner, Spring Tiger. From the audience, GWM nurse Ruriko wonders in the masked Haruna is really Tiger Mask’s younger sister. Haruna looks nervous on her walk to the ring, but seems comfortable once she’s standing on the mat. The second team makes their entrance and Payne is noticeably absent. Replacing her as Queen’s partner is X Woman, the wrestling gimmick of Miss X. She wanted to see Haruna get beat down and she’s going to see to it herself. Miss X has never been more like Stephanie McMahon than she is right now. The match begins with the two first-time wrestlers; X Woman and Spring Tiger. They lock up and are both shocked by the strength of their opponent. They then trade stiff kicks to the stomach and tag their partners into the match. A quick exchange for the newcomers. Mint gets Queen in a side headlock, but it’s turned around on her when Queen dumps her to the mat with a bridging backdrop. The move clearly rocked Mint, who quickly tags Spring Tiger back in. Queen looks excited to face the rookie, but X Woman demands that she is brought back into the match. Oddly enough, X Woman uses the Figure Eight on Spring Tiger. She must have learned it from Queen. Spring Tiger fights through the pain and reaches the ropes to break the hold. The tide of the match turns and Spring Tiger ties up X Woman’s legs with an Indian Death Lock. Then she bridges back and turns the hold into a Muta Lock. Not bad for an amateur. X Woman just barely manages to make it to the rope to break the hold as she begins to fade. Both women are starting to get gassed, which isn’t surprising seeing as this is new for both of them. X Woman takes down Spring Tiger and attempts to apply a Sharpshooter, but Tiger stops it and turns it into an ankle lock. Rather than watch her boss have her legs ripped apart, Queen runs into the ring and kicks Haruna in the back. Miss X tries to stand, but her legs are very wobbly. Spring Tiger runs at her, but is struck by flurry of elbows and a bridging German suplex. It looks like X Woman might have things won until her legs give out and she breaks up her own pin at the count of two. With X Woman tending to her injured legs, Spring Tiger takes the opportunity to reapply the Muta Lock. Miss X almost reaches the ropes, but Spring Tiger quickly drags her away and transitions into a Bow and Arrow. It appears that X Woman passes out from the pain. Before the referee notices it, Queen rushes into the ring and punts Tiger in the head. Back at the Max Dome, we find out that Milk’s appendectomy went smoothly so the tag team of Candy Pair should reform soon enough. Haruna exits her post-match shower and we see that she’s covered in purple bruises. She worries how she’s going to explain everything when she gets home, but Mint tells her to wear the bruises like a badge of honor that she’s earned. Her phone rings and even though she’s just won her first wrestling match, Haruna immediately slips back into her role as Naoto’s manager. Seeing this kind of character growth out of Haruna was fantastic. After this episode, I might actually be more interested in her journey as a wrestler than I am in Naoto. One journey that we won’t see continue is that of X Woman. Miss X sits in her office with a taped ankle and says that even though the fans want a rematch between her and Spring Tiger, she won’t be wrestling again. Finally, this episode picks up on a story that they had abandoned for a few weeks. We go to the snow covered Tiger’s Den where Takuma climbs up the side of an icy mountain. At the top, Takuma is met by a wrestler from his past named Ricardo. In next week’s episode, Takuma competes against all the GWM wrestlers that Tiger Mask has vanquished in the mysterious Hell in the Hole match. I don’t know what this is going to be, but I’m excited! Tiger Mask W and Tiger Mask to tag against Okada and Gedo, Tiger Mask W v Okada singles announced for NJPW's anniversary shows! Last week I wrote about Okada randomly mentioning wanting to wrestle Tiger Mask W in a post-match promo. In a shocking turn of events, we’re actually getting that match at the New Japan anniversary show! This will be the first time we get to see real life Tiger Mask W in a high profile match like this. I have no doubt that he’ll go out there and kill it. It’ll even be a ton of fun to see him tag up with Tiger Mask IV on the show prior to that. That’s all I’ve got for this week. Thank for reading and I’ll see you back here next week for a chat about Hell in the Hole. This Week In ROH: Ladder War VI, ROH/PCW, Pittsburgh/Lockport Previews, & More!